A couple of weeks ago, the hubby and I went to Books-a-Million to waste some free time. Because I get a lot of questions about what to do for different eye shapes and hooded eyes, I headed over to the Fashion & Beauty section and looked through some books for tips. Here’s some great tips I got from “Eye Candy” by Linda Mason. I snagged the hubby’s phone and took some pics of the pic examples they have in the book. Other than these tips though, I really wouldn’t recommend the book for much of anything else. Most of the looks in the book seem as though they are sloppily put together and not blended very well at all. But if you think you can get some ideas from the book, then maybe you’ll want to stop in your nearest bookstore and take a peak at the book. Be sure to check back tomorrow for more tips on shaping hooded eyes. All of the following material is from the book “Eye Candy”, by Linda Mason. "To make your eyes look rounder, apply eye shadow or eyeliner starting at the inner corner of the upper lid and going all around the eye with almost the same thickness. You can do this with the crease line, too. 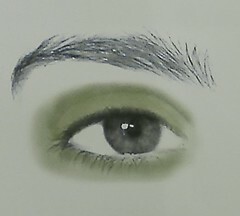 Start in the inner corner of the crease and bring it around the outer corner to join the color under the eye." 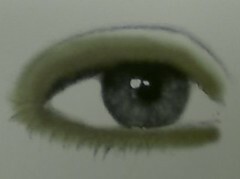 "To elongate your eyes, apply a dark eye shadow or eyeliner in the outer corner, along the upper and lower lash-lines. Then use a mini blender brush to blend the color out and up." To LIFT your eyes, blend a deep shade of eye shadow or eyeliner from the outer half of the upper and lower lash-lines, up and out, toward the top of your ear. Be careful not to stop too sharply and create an unnatural-looking line. The color should be blended so that you cannot see where it stops. "To DEEPEN and ENLARGE your eyes, place a deep eye shadow on the upper lid, from the base of the lashes to the crease, and under the eye."